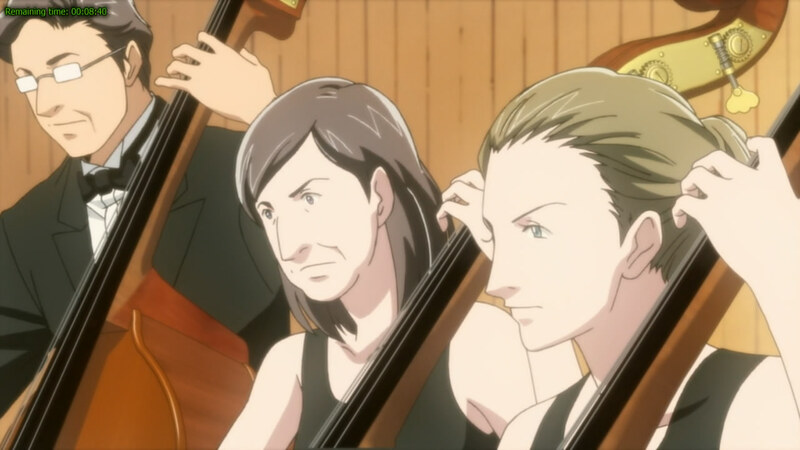 Classical music orchestra is Serious Business! 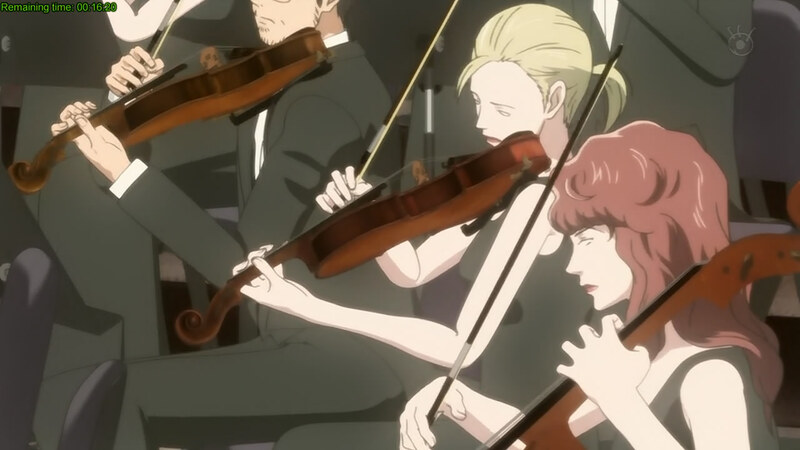 As mentioned in the last review, Nodame Cantabile Finale is the fourth 2010 anime title reviewed here for the ongoing ‘Anime of the Year 2010’ audition. This anime is chosen specifically because I’m tired of seeing an application of a certain animation technique. Does this 2010 title utilized it just like the what the three other previous audition participant had? Or maybe should I worry about something far more important? Like the storyline, for example? The two main protagonists of this anime, also the best of them all. After all the events in the preceding two seasons of this series, the two main protagonists are still doing their things in Europe. 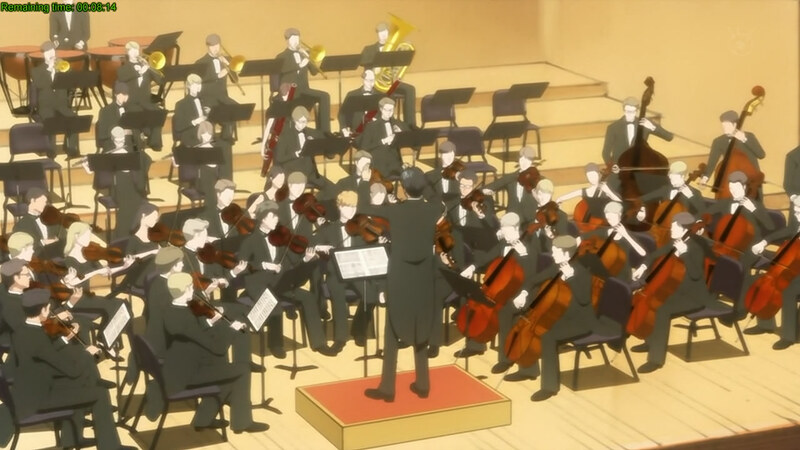 The main male protagonist conducts more orchestras while the main title female protagonist plays more piano. 13 episodes and plenty of omitted manga materials later, this anime ends, for good. As a recap, in the first season, about 9 or 10 manga volume worth of materials was spread in 24 episodes with very minor omissions. The first season is so good it held the ‘Anime of the Year 2007’ title for more than two years, beating many illustrious challengers such as Tengen Toppa Gurren Lagann and Kaiji before being deposed recently by Bokurano. For the second season, about 6 or 7 manga volume worth of materials were crammed into a pithy 12 episodes, with a little bit more omissions that in the first season. This has two effects; first the pacing of the second season is faster than in the first, way faster. Secondly, the fast pacing combined with the various omissions from the reference manga caused the storyline to be disjointed, therefore unable to develop and flow smoothly. The biggest problem that the second season has is not the quality of the storyline (the manga is excellent, one of the best I have ever read) but the method of adaptation and its presentation. And for the third season reviewed here, few things has changed. The episode count is still limited at 12 (13 if the non-canon episode is also counted) and whatever manga material that is still left unaired are crammed into them. But this time, the director slowed down the pacing by removing huge amounts of very important plots. The most striking example is the story arc that sees the main title female protagonist meeting with the main male protagonist’s father, who is also a pianist just like her. This directorial maneuvering helps improve the pacing and the development of the remaining storyline, at the cost of quality. This sir, is not acceptable. Regardless of the fast pacing and somewhat incoherent plot flow that plagued the second season, its story is still good and awesome. That’s why the second season scored 8 out of 10, which is a respectable score around this part. Even the previous 3 participants of the currently running ‘Anime of the Year 2010’ audition doesn’t score that high. The sacrifice of storyline quality for a better presentation IMO is not worth it. For those who doesn’t read the manga and only watched the anime, the improvement in presentation should be worth it though because the remaining plot-lines that survived the wrath of the director were executed and storied very well. The solid yet awesome ending is a good example of it. Character developments continues very well in this third season, but if the arc about the main male protagonist’s father is not completely omitted, could have been better. That missing arc would have helped advanced the main male protagonist even further. 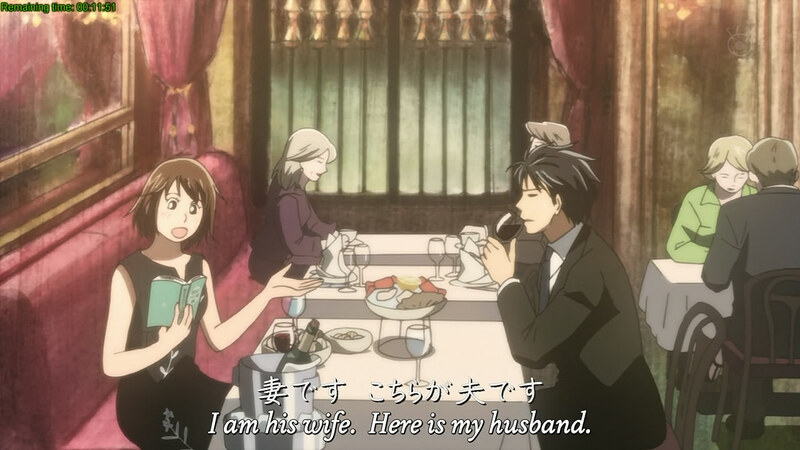 The saner pacing in this final season also helps the developments of other dwellers in Nodame’s apartment. The best characters remains the two main protagonist of course. Barging into the shower while the main male protagonist is still inside is our heroine's specialty. My comments from the first season still applies. They are as excellent as ever and a positive aspect for this anime. My comments from the first and second season still applies too here. In other words, a positive point for this anime. The music in the third season has recovered from the minor blip that happened in the second season. The OP theme and OST are great as usual, and the ED theme is the best song theme that this series could ever have. A positive point for this anime. While Mr. Director Chiaki Kon is definitely a destroyer of franchises, at least he is sane enough to not use that abhorrent blurry animation technique I have mentioned in the previous three consecutive reviews before this one. Animation in this anime is still as slick as ever, with virtually no fast-scenes and choreography that I can comment on whatsoever. That is probably why Mr. Director doesn’t use it in this anime. Mr. Director really dropped the ball with his decision to omit major story arcs out from the final season of this series. He would have done better if he just stick to repeat what he has done in the second season, if following the footsteps of the director of the first season (not Chiaki Kon) is too hard for him. But then again, not using the animation technique that I hate is very good decision too. Attempts by the main male protagonist to do the same doesn't work though. 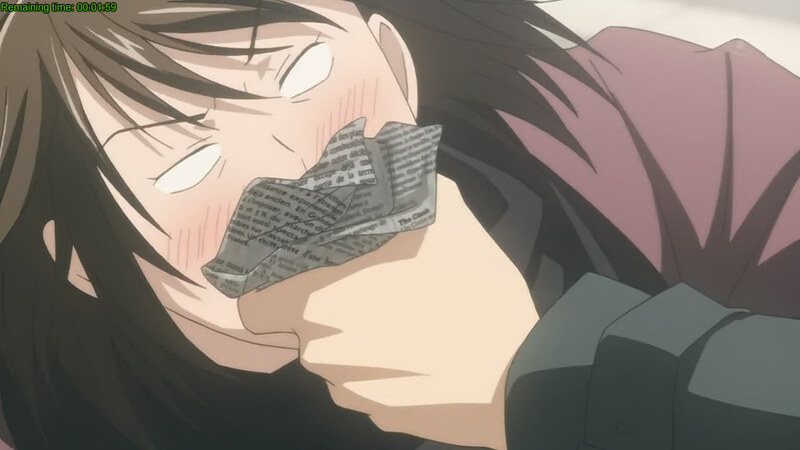 Nodame Cantabile Pari-hen, the second season of the outstanding Anime of The Year 2007, Nodame Cantabile, has arrived in this blog. Can this anime repeat the performance of its illustrious predecessor who managed to beat off the challenge of many anime series to keep the Anime of the Year 2007 award? Or can it even unseat the current incumbent for 2008 version, Wolf and Spice? Read on to find out what will happen. 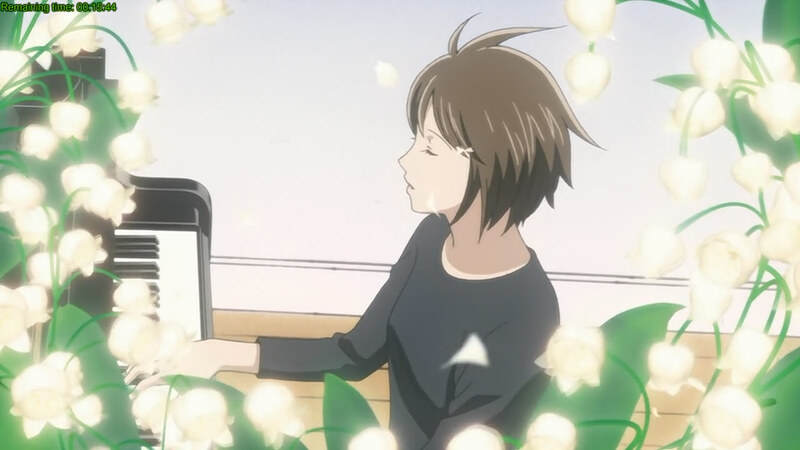 Continuing from the end of first season, our main protagonist now has moved to Paris, France as Nodame continued her study at a conservatory while Chiaki is entering a conducting competition. Meanwhile, we will be able to see the whirling relationship between the protagonists taken even further as they juggle between their heavy commitments and relationship. One of the first things that concern me about this anime is that it only has 11 episodes, and my biggest fear was confirmed 10 minutes into the first episode of Pari-Hen. Unlike the first season, the second season has hurried presentation and pacing that is so fast, you're thinking that you are watching that Evangelion movie. My heart sinks when 3 volumes of manga materials were covered in a mere 2 episodes (if this anime is Naruto, you will see 50 episodes WITHOUT FILLERS just to cover the same material). While the pacing slowed down considerably in the second half of the anime, the damage has been done, and Wolf and Spice will still keep the Anime of the Year 2008 title. The story by itself is excellent, although it has more alterations compared to the first season's adaptation of the manga. More minor scenes have been omitted, but the major plots are still there and largely untouched. Pity about the pacing though, and maybe the omissions and alterations (mostly the former) is what made the flow of the story being paced so fast? The ending is very well done too, probably done even better than the first season and managed to prepare the series for the next season. Excellent character development is another thing that the second season has managed to retain from the first, although the horrid pacing tried to ruin this for the new characters. 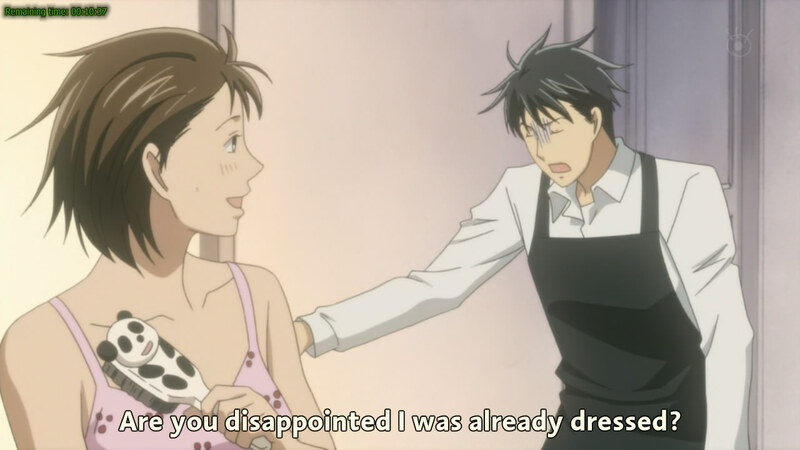 The new characters are interesting in their own right, especially with some of the dwellers in the apartment that Nodame and Chiaki shared. I will still look forward to the new season, and I hope it will have more episodes so that the mistakes with pacing can be eliminated. Some of the funny scenes in the anime. Basically, there are no changes from the first season. Change is not always good, despite what a certain black president wants you to believe, and this is definitely a positive point for this anime. New characters (and old too) are created wonderfully. 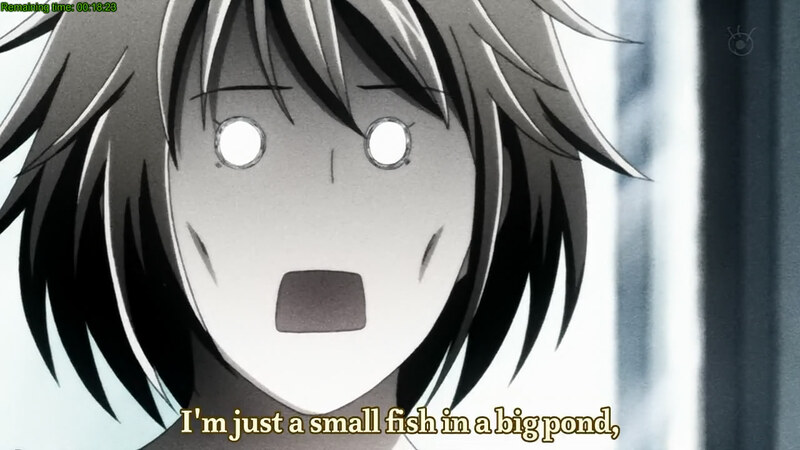 Nodame and on her the faces she made in the course of the anime. There are also no changes from the first excellent season. 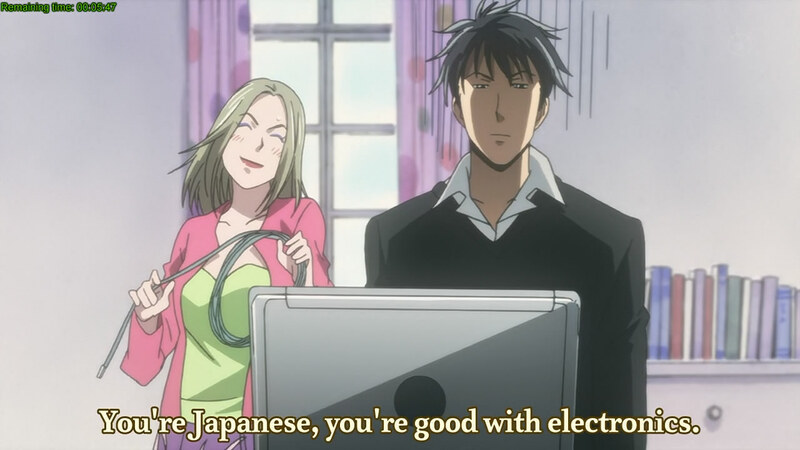 In fact, I think Nodame has improved, especially with her attempts to learn French and also when she does her 'Chiaki's wife' impersonations. Ayako Kawasumi is truly brilliant in this anime, just like she does in the first season. Of course, Chiaki is still his usual self while Tanya also has done very well. The flowery scene that are used to describe classical music performances are still here, and are very helpful to explain the context and mood of any given performance. The second season has regressed a little from the first in this aspect. While this anime has good OST and ED theme, the same thing cannot be said about the OP theme. As usual, the classical pieces are pleasant to listen to, adapting perfectly to the storyline instead of being the storyline (looking at you Macross 7). Watching this anime in HD is truly a pleasant experience; the animation is fluid and smooth. 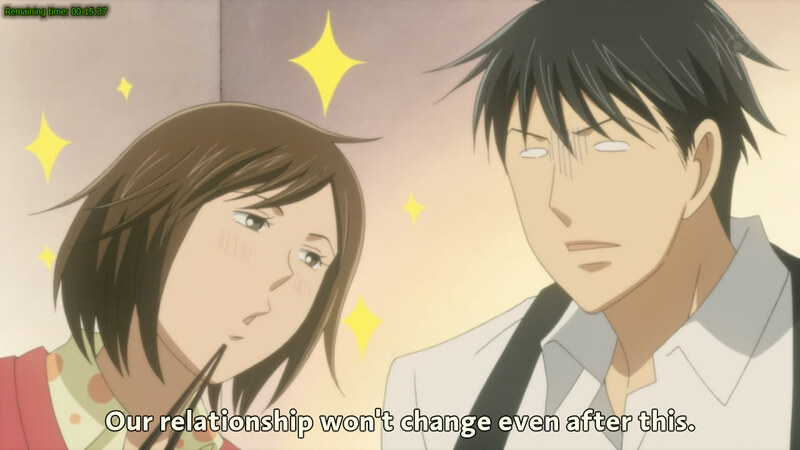 There are no fast-paced scenes (ironic considering that the story is fast-paced) and choreography for this slice-of-life romantic comedy is non-existant. The directing failed for the aforementioned pacing problems above, but has done everything else well. …although playing violin without the bow touching the string is somewhat not very logical do you think? 8 out of 10. The pacing problem kills this anime's chances of reaching the same height that was attained by its predecessor. I hope this series don't pull a Macross (remember, the first installment get a perfect score, then the second one has slightly lower score before tanking in the third installment) and hope that the third season improves with more episode count and more Nodame! Blassreiter will come next! 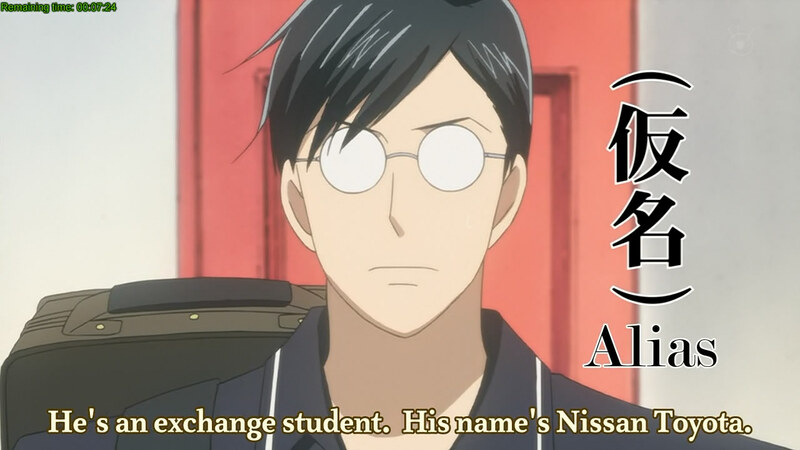 My car has the same surname as our main protagonist is.